June turned out to be a pattern changing month. Cool, wet conditions prevailed in May and the furnace kicked on for most of June. After a nice cool down over the Independence Day holiday, temperatures have ramped right back up. 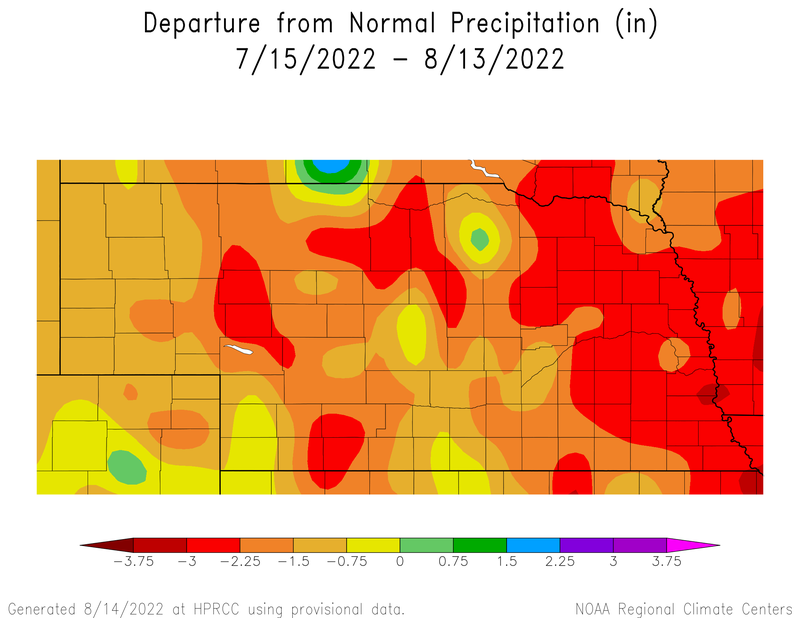 Precipitation over the last 30 days has been primarily over the central sandhills and east central Nebraska (right). These are the areas where thunderstorms have been tracking and over-lapping, which is about the only way to get precipitation in June and July. Other than that, the state has been primarily dry; however, some recent rain has alleviated some pressure. The driest areas seem to be in the Panhandle and south central Nebraska from about Minden to York. Although the precipitation was highly variable, most of this area received less than two inches over the last 30 days, which is 2-4 inches below normal. The above normal temperatures lately sped up the drying process. 30-Day temperature departures are 4-8°F above normal and that has brought some color to Nebraska in the last few Drought Monitor (left) maps. We now have an area of moderate drought in far northwest Nebraska near Chadron and between Kearney and Grand Island . This map doesn't account for the rain that fell after Tuesday, June 5. The crops are also beginning to use a substantial amount of moisture. Potential ET values have been around 0.2-0.25” per day, so corn at the 14 leaf stage will be using nearly 0.2-0.25” of water per day. This amount of water use will use up soil moisture quickly, so it is important to monitor soil moisture status closely over the next few weeks. The forecast is fairly uneventful and very “summer-like” for the next few days. Temperatures over the weekend and into next week will by in the upper 80s and low 90s. Precipitation chances will be small and limited primarily to pop-up thunderstorms with the best chances on Sunday night into Monday. It will be a good weekend to head to the lake. As we get into next week, eastern Nebraska has the best chances for precipitation on Monday through Wednesday, as the west looks to remain relatively dry with a few chances for isolated thunderstorms. A moderate cool down looks to arrive the middle of next week and temperatures will stay in the 80s for a few days. By next weekend, the models have temperatures starting to warm back up as a ridge of high pressure begins to build back in. If this ridge of high pressure does what the models are predicting, we could have very warm and very dry weather for the third week of July. The cool down next week will be very much appreciated and will give us some opportunities for moisture. Let’s just hope we don’t miss them. The 6-10 Day (July 14-18) and 8-14 Day (July 16-22) Outlooks (right) from the Climate Prediction Center are showing increased chances for above normal temperatures for the central and eastern parts of the U.S. The best chances for above normal precipitation are in the northern and eastern U.S., which does include parts of Nebraska. This pattern is due to the location of the jet stream and this will be the area where shortwave disturbances will travel and provide the best chances for precipitation. Right now, the odds are a lot higher for this area to remain east of Nebraska, possibly providing cooler temperatures and moisture for the “I” states during corn pollination! 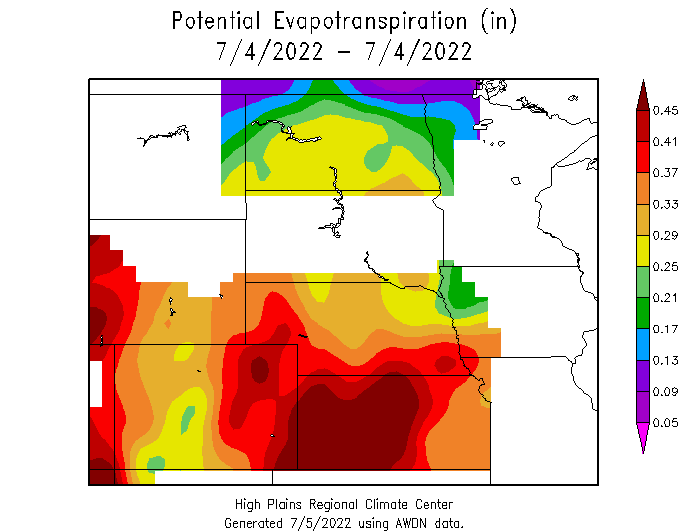 Western Nebraska looks to be the area most vulnerable to the hot and dry weather, with better odds as you move east. This is still a week or two out, so a lot can change. The models are not showing a lot of consistency in the location of this pattern, but it is probably best to not get behind on irrigation over the next 10 days to two weeks. With corn pollination upon us, it is not a good time to play catch up. Looking past the next few weeks is a coin flip right now. The La Niña that was building in fast and furious in May has slowed down considerably. We are still projected to have a La Niña later this fall and early winter, but seeing any impact before that may be quite limited. There is still a lot of warm water in the higher latitudes of the Pacific Ocean. This lack of La Niña signal limits the predictability in the three-month outlook . 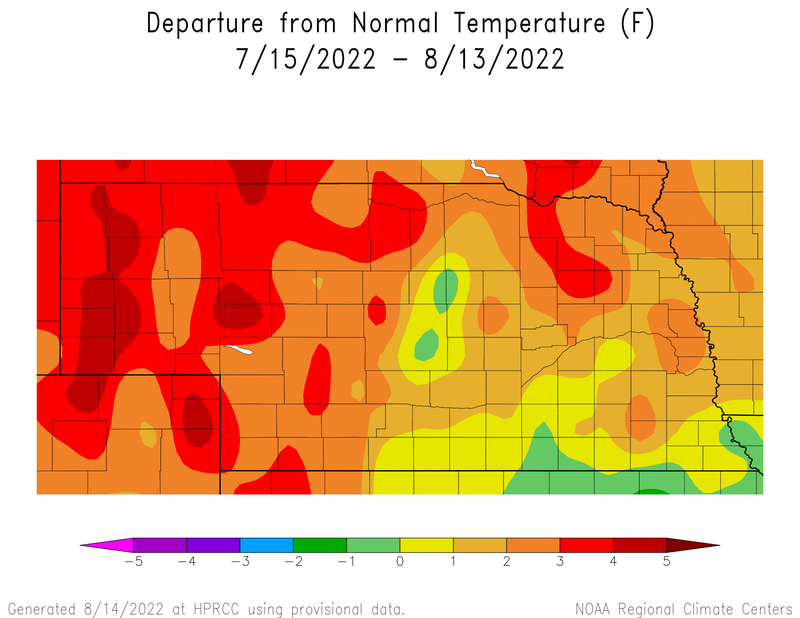 In summary, we are nearing the climatologically warmest week for Nebraska, so anything under 90°F is a blessing. It looks like the next week or so will have moderate temperatures with a few opportunities for precipitation. The following one or two weeks may see high pressure build in and turn hot and dry, especially for the western half of Nebraska. Let’s hope that ridge does not get as strong or stick around as long as the models currently predict.